A method is proposed for determining the temperature dependence of the theoretical strength of refractory substances on the basis of an analysis of the function of the change in the potential energy of the body from the relative elongation, calculated from the experimental data on the modulus of elasticity, the coefficient of thermal expansion, density, temperature dependence of the heat capacity and melting point. The advance of mechanical engineering requires the creation of structural materials that retain high strength values ​​at the maximum possible operating temperatures. Among most high melted refractory compounds and elements, nitride and aluminum oxide, silicon nitride and silicon carbide, boron carbide, partially stabilized zirconium oxide and sialons are most promising for the creation of such materials . It is of interest to compare the values ​​of the theoretical strength of refractory substances at high temperatures in order to identify those that, along with these, could be recommended for in-depth studies on the possibility of obtaining high-temperature structural materials on their basis. The number of papers [2-6] is devoted to the problems of calculating the theoretical strength of materials on the basis of an analysis of two-particles interaction potential . The problem of determining the temperature dependence of the theoretical strength was considered in , where it was shown that the theoretical strength decreases linearly with increasing square of the average amplitude of atomic oscillations in a solid. In this paper, we propose a method for calculating the temperature dependence of the theoretical tensile strength on the basis of an analysis of the function of the change in the potential energy A U(x) of a material in solid state from the relative elongation x = (l - 1o) / lo, where lo and l are the linear dimensions of the body in equilibrium state and under the action of the external force, respectively. where xmax is the elongation corresponding to the maximum tensile stress. Let us consider the basic relations connecting the function of the potential energy change ΔU(x), the specific form of which, generally speaking, is unknown to us, with the physical-chemical and mechanical properties known from experiment. We also assume that the dependence of the change in the internal atomic interaction potential on the relative change in the internal atomic distance x = (r - r0) / r0, where r0 and r are the average distances between atoms in a solid body at absolute zero without external pressure and under it, respectively, these coincide to within a coefficient equal to the effective number of bonds in the direction of extension, with the function ΔU(x). where λT is the average amplitude of the thermal vibrations of the atoms, referred to the distance between atoms. where λT+ and λT- are the roots of equation (15). and the strength by substituting the value of xm found in equation (16). The figure shows the temperature dependencies of the theoretical strength calculated by this method on the basis of reference data [9-14] for the most common ceramics. It should be noted that the total loss of strength occurs up to the melting point, which agrees with the strength test data of real ceramics [9, 10, 13]. The results of a comparison of the theoretical strength shown in the table for various refractory compounds showed that the most common ceramics do not always have the highest theoretical strength and its choice as a basis for the development of high-temperature ceramics is often due to low cost, chemical and thermal stability and technological considerations. At the same time, for critical parts that are operated in a neutral environment at particularly high temperatures, it is necessary to pay attention to such compounds as TaC, NbC, HfC, HfB2, TiC, TiN, TaB2, which retain high values ​​of theoretical strength up to 2500 K.
Using the proposed method, it is also possible to calculate the temperature dependencies of the elasticity modulus E and the thermal expansion coefficient a, which is important for evaluating the compatibility of various compounds in high-temperature composite materials, as well as the stability of high-temperature coatings. 1. Kulik O. P, Denisenko E. T, Krot O. I. High-temperature structural ceramics. Preparation and properties: Preprint Ns 2. Kiev: IPM Academy of Sciences of the Ukrainian SSR, 1985. 10 p.
2. Izotov A.D, Lazarev V.B. The destruction of ceramics at high-speed loads from the point of view of physical chemistry. J.. Phys.Chemistry. 1986. T. 55. N 1.p. 192-196. 4. Izotov A. D, Lazarev V.B. Theoretical Strength of Ceramic Materials. Izv. AN USSR. Inorgan. Mater. 1985. Vol. 21. Ns 5. p. 706-711. 5.Kelly A. Strong solids. L. • Oxford Univ. Press., 1966. 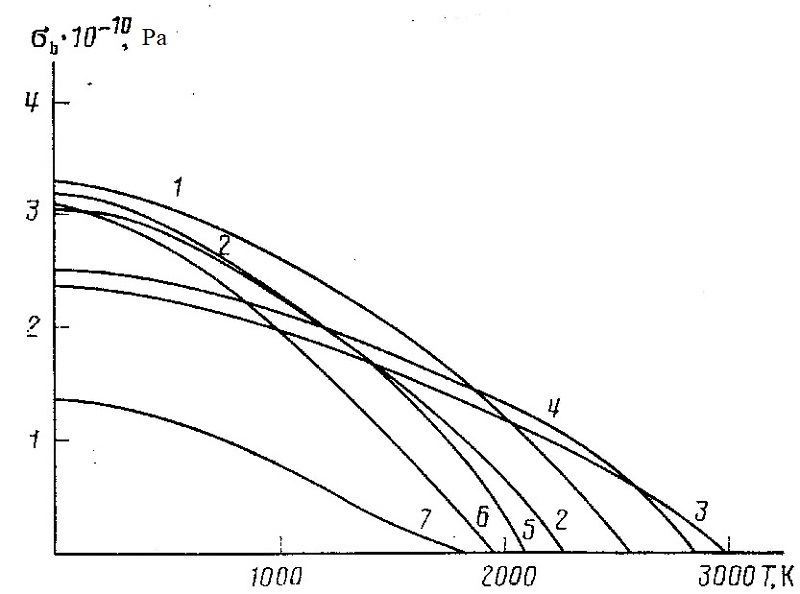 263 p.
6.Barteniev GM Strength and mechanism of polymer destruction. M .: Chemistry, 1984. 279 p.
7. Zwicky F. Die Reifestigkeit von Steinsalz. Phys. unserer Zeit. 1923. Bd. 24. Ns 6. S. 131-137. 8. Osipov K. A. The relationship between the theoretical strength and the speed of crack propagation during a crust the destruction of metals with their thermodynamic parameters melting. Dokl. AN USSR. 1983. T. 271. N 3. p. 657--660. 9. Properties, production and application of refractory compounds, Ed. Kosolapova T. Ya. M .: Metallurgy, 1986. 928 p.
10. 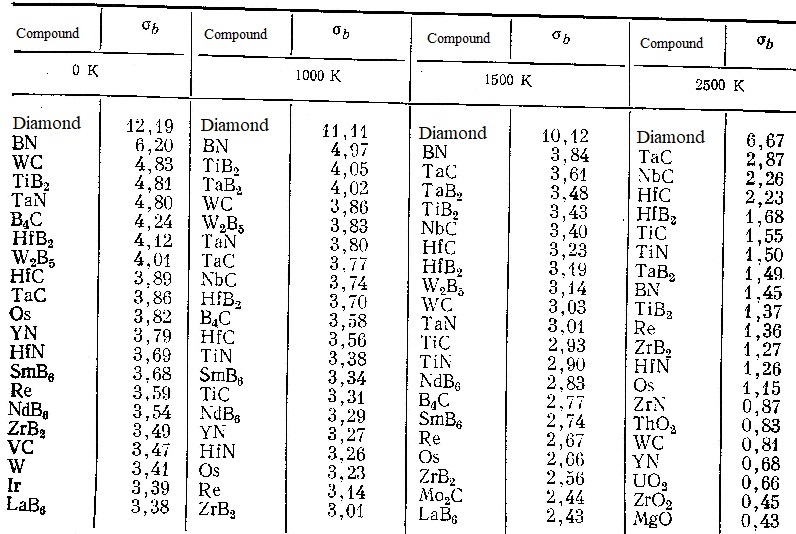 Physicochemical properties of oxides, Ed. Samsonova G. B. M .: Metallurgy 1969. 456 c.
11. Frantsevuk I. N., Voronov F.F., Bakuta C. A. Elastic constants and module of elasticity of metals and non-metals, Kiev: Nauk. dumka, 1982. 286 p. p.
12. Bojtovych P. F. Refractory compounds. Thermodynamic characteristics. Kiev:. Science. dumka, 1971. 220 p.
13. Ceramics from highly fireproof oxides. Ed. D.Polibojarinov D.H., Popilckoro P. Ya. M .: Metallurgy, 1977. 304 p.
14. Babushkin V.I., Matveev G.M., Mchhedlov-Petropyan O. P. Thermodynamic of silicates ~ Publishing house for literature on construction, 1972. 351 p.